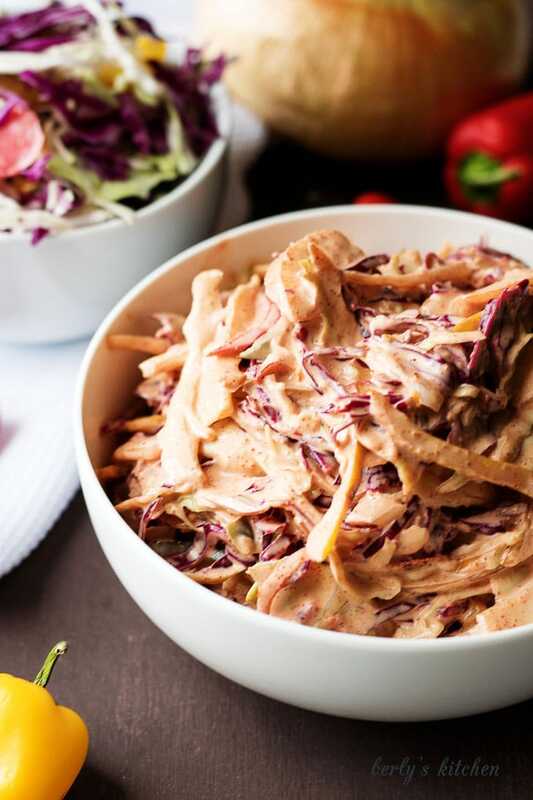 A unique spicy coleslaw recipe made with four ingredients and loaded with flavor. It’s simple to prepare and is used to top your favorite sandwich or taco. So, the other day, Kim and I were trying to figure out what we wanted for dinner that evening. 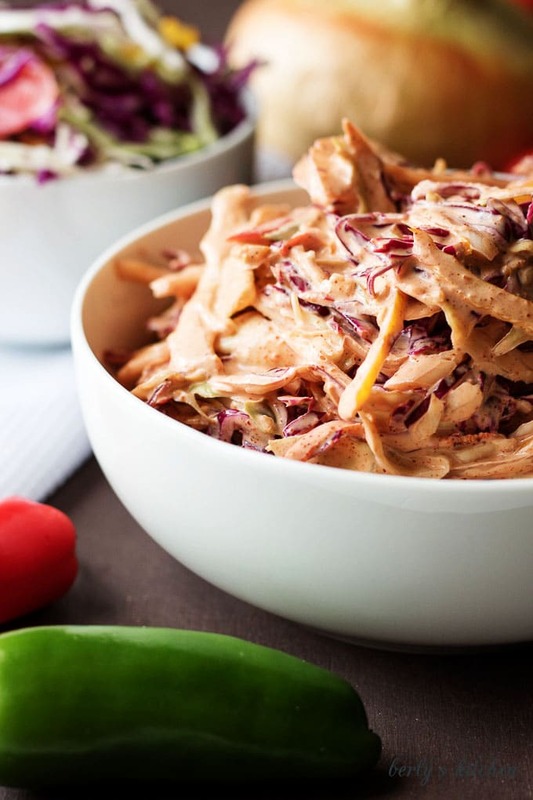 It dawned on us that we had not made my slow cooker shredded chicken in quite some time. The recipe sounded great, but we wanted a little crunch with our tacos. After searching the kitchen, we found all the ingredients needed to create a delicious spicy coleslaw. Within minutes, I had made a creamy, fiery, condiment that Kim liked so much she was eating it by itself. All you need is a bag of coleslaw mix, some mayo, lemon juice, and a few spices to make it yourself. Now, we decided to add a little jalapeno, some onion, and mix sweet peppers. You don’t have to make your version the same way. As long as you have the cabbage mixture, some lemon juice, mayonnaise, chili powder, and chipotle powder, nothing more is needed. 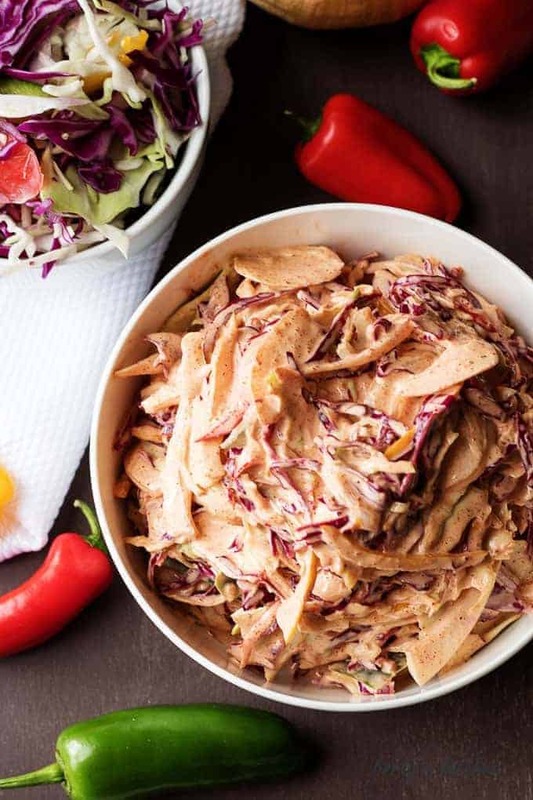 A food processor with a slicing attachment makes adding other vegetables to your spicy coleslaw a breeze. The real star of the dish is the dressing. Mixing lemon juice with the mayo creates a fresh citrus flavor that really pops. The crunchy cabbage and other veggies are a welcome addition to any taco. You could also use it on a barbecue sandwich; especially, one with a sweet sauce. On the other hand, you could be like Kim and just grab a fork and dig into the spicy coleslaw. It’s a versatile dish that I sincerely hope you decide to try out for yourself. In closing, I wish you a long life, everlasting love, and a full belly! 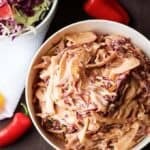 A unique spicy coleslaw recipe made with four ingredients and loaded with flavor. It's simple to prepare and is used to top your favorite sandwich or taco. First, wash the coleslaw mixture, pat it dry with a paper towel, and place it in a large mixing bowl. Next, thinly slice the jalapeno, onions, and peppers and combine them with the coleslaw mix. Then, in a separate small mixing bowl, whisk together the mayo, lemon juice, chili powder, and chipotle powder to create the dressing. Last, add the dressing to the coleslaw and toss everything together. Serve as a condiment on your favorite dish or eat it as a stand-alone side. The calorie count listed is an approximation based on the listed ingredients. The number of servings varies based on how much of the coleslaw you eat in one setting. Keep the coleslaw chilled at all times as it contains mayonnaise. You can eat it as a condiment or as a side. Ooooh that sounds super yummy! I have never had a coleslaw recipe quite like this, but I am excited to try yours. A coleslaw is as good as its dressing. I really like coleslaw and this one looks really tasty and healthy. 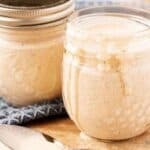 It would make a great meal supplement and even as a dressing for sandwich. I have not eaten coleslaw in years! I simply got bored with the flavor. I never thought about spicing it up so I am definitely going to try this again and use this recipe. I love the addition of jalapeno! I can’t eat coleslaw on it’s own but I love the idea of adding it to a sandwich – I think this would go great on a brisket sandwich. Mmmmm. This coleslaw recipe sounds great! My husband and I love spicy foods so I can’t wait to try this recipe. I LOVE coleslaw (I don’t know why a lot of people don’t) and I love spicy food! This is a perfect side dish to dinner for me! I can’t wait to try it! I have to admit I’ve never been a coleslaw fan as it doesn’t taste of much, but this might add some really nice flavouring, I’ll have to give it a try. This sounds like a yummy slaw recipe. I like to have slaw at my cookouts and on pulled pork sandwiches. 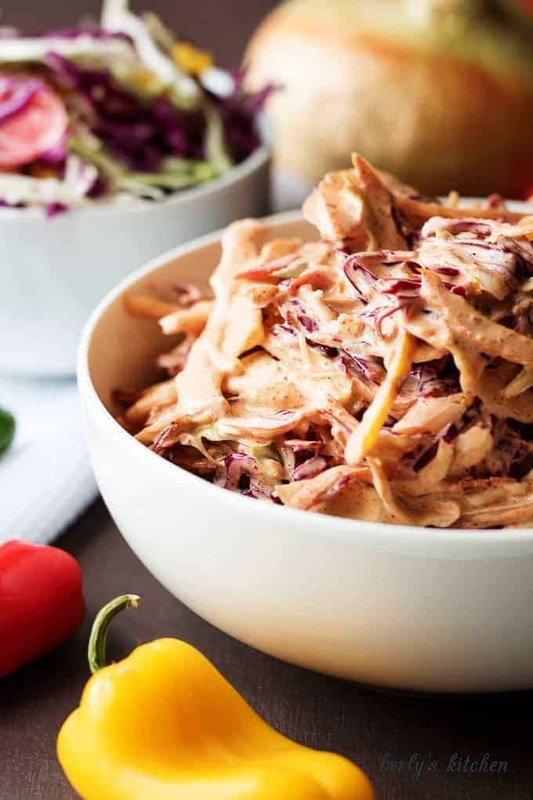 This spicy slaw would be great on a chili dog. I have never tried a spicy cole slaw. This one has an interesting color, maybe it’s from the chipotle? I am a huge fan of cole slaw and I love the great taste of it. This spicy version sounds so delicious. My husband loves spicy food so hed like this too. My mom loves coleslaw, I definitely have to share this with her! I think a spicy slaw would go over great with my family at a BBQ. Looks really easy to make which is right up my alley. Thanks for the suggestion — will need to try it next time. I have never tried coleslaw. But I know my best friend loves coleslaw and this definitely is going to be something she would love to try out. I will share this coleslaw recipe with her. Now that is my kind of dish. I am a huge fun of anything slaw and this would be added in my list, thank you. My kids just love coleslaw, but I’ve never attempted to make it. I bet my teenager would just devour this. 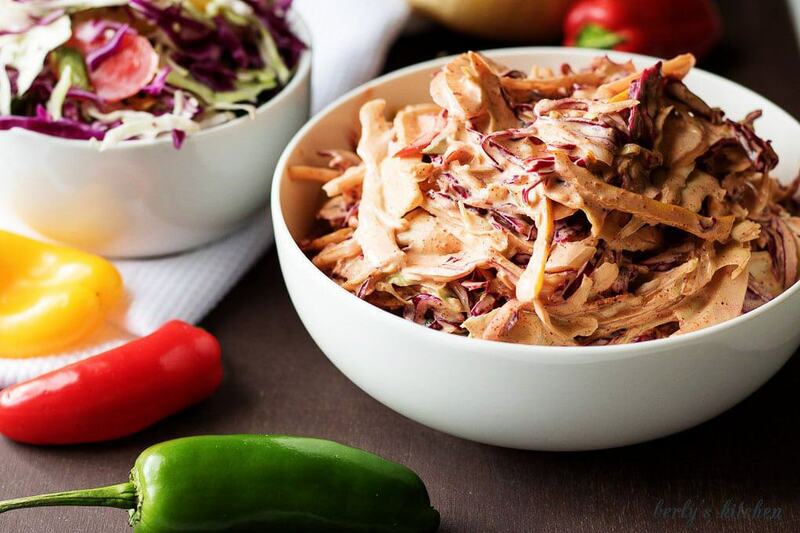 I am a slaw FANATIC – what a tasty combo!